A few years ago, Michael McGinnis escaped from outside Chicago (Kankakee) and headed down to Miami by way of the Madison Media Institute for a change of pace. It wasn't always a comfortable pace — sleeping on couches, living like a studio rat, and popping shots of bourbon. But it was a change, one that helped the sound engineer and closet songwriter slide into the frontman seat. His band, Plains, mixes up Midwestern earnest and laid back Miami surrender in a tumbler and then shakes it all up into some sort of shambling indie rock that feels as right at the beach as it does in the basement. And in a place like Miami, his band of sometime players have hit both venues. Recently, they even made a few trips up the coast on a mini-tour. Plains self-titled LP dusts off indie rock in a different direction. Don't mistake the outing by McGinnis and company as unseasoned upstarts. The whole band knows something or three about the music: Jorge Graupera (guitar), Max Johnston (bass), and Jorge Rubiera (drums). But then again, you never know. The lineup may change as Jared McKay and Michael John Hancock filled in from time to time to help McGinnis get his sound off the ground. Even if the players change, they still come across like a small-scale supergroup with a big sound, one that some Miami papers say are good enough to put South Miami back on the map as an indie incubator. (Seriously, I can't make this stuff up.) That makes sense. McGinnis, among other things, is an artist and engineer at two-year-old Honor Roll Music. The point is that McGinnis has made plenty of friends on the fringe. And with his take on where murky bass lines, shrill riffs, and penetrating frequencies happen to land, anybody who wants to have fun seems to want to be part of it. For a big guy, McGinnis has a strangely relaxed sound that borders on surf rock, but remains grounded and smooth. The single, Innovator, is a great introduction to Plains with some fuzziness. So is Poor Little Space Monkey, the song McGinnis released last year with the help of Honor Roll Music and 10k Islands. Four more songs for the playlist and cherry pick from the rest. The self-titled release, backed by 10k Islands, is compelling with every second of every song filled to capacity. End Of The World is a somber, personalized question of who people turn to in their hour of need. 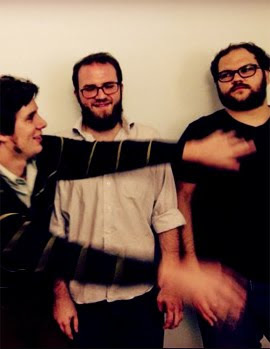 Sleep Deprived is a chirpy, uptempo glider (but retains the relaxed vocals). Back Feeling is a silky post-punk indie rock mix. And Roots brings more diversity with a grungy, near-throwback indie rocker. McGinnis isn't nearly as strong on the pop-infused Judy, experimental Dry (despite some likability), or overproduced (but interesting) Stains. Check them out if you like, but the best of the album is easily on the front half with the balance feeling like the music is leading somewhere interesting but never quite gets there, with the exception of the haunting Break You Up. Plains Self-Titled Release Floats To 5.1 On The Liquid Hip Richter Scale. You can catch the self-titled release Plains on iTunes. You can also find Innovator for free on Amazon or download it from BandCamp for now. Find the entire album for download on Amazon.